Usually when a company decides to hire a person, they present him with a job offer letter in which they elaborate on the responsibilities of the job and the salary and perks offered. The person can either accept the offer or reject it. He may sometimes also want to negotiate the offer. Whatever the scenario, the person and the organization should write a highly professional letter for the purpose. Thanks to the Sample Letter, this surely becomes easier. Sometimes the offer made by a company may not be as per the expectations of the person. In such cases, he is bound to reject the offer. 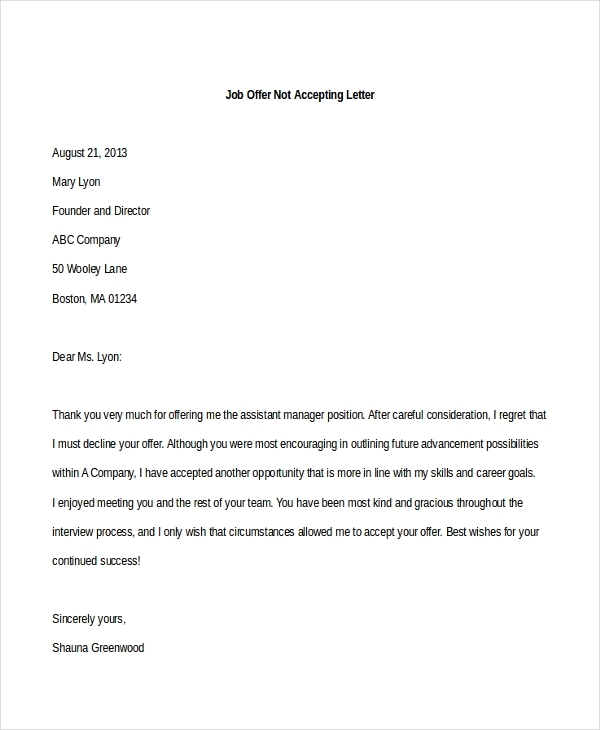 Using this sample rejection letter gives him an idea about how he can convey this message to the company in a professional manner without offending them. You may also see Offer Letter Samples. 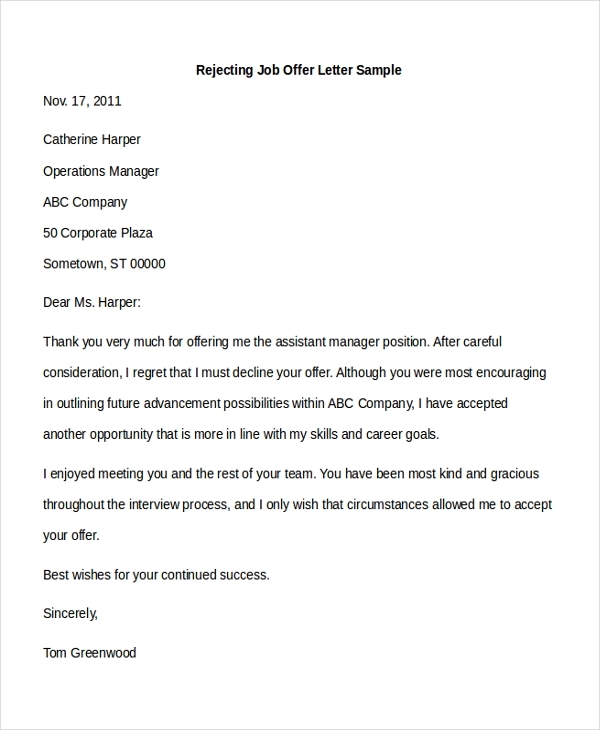 As the name indicates, this sample letter can be used by a person who may have decided not to accept a job offer. However, he needs to convey this message to the company along with the reason for rejection in a professional way. The aforesaid letter helps him with this. 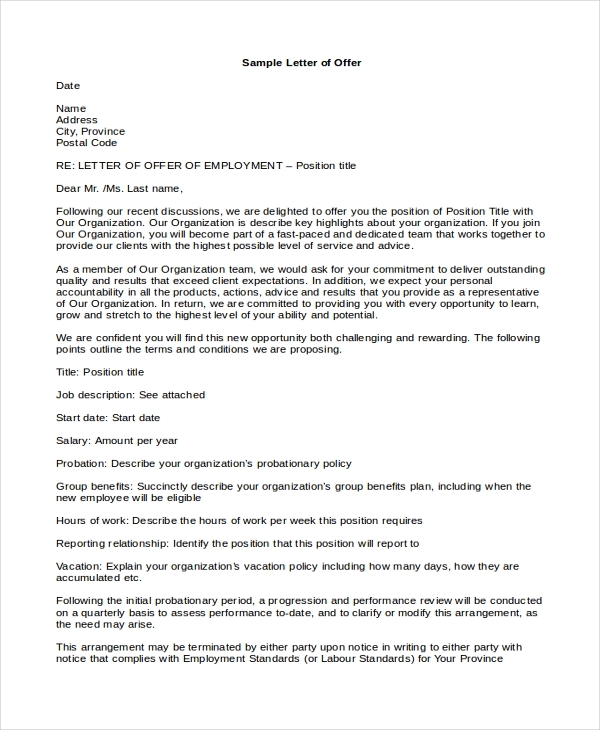 This is an example of an offer letter which can be used by organizations to draft a highly impressive offer letter for an employee. This sample gives the company an idea of the format to be followed and the technique to be used while writing the letter. You can also see Job Offer Acceptance Letters. When a company sends an offer letter to a person, it is a good practice that the person sends them an email thanking them for the offer. In case, the person is not sure how to draft such an email, he can take some cue from this sample email. 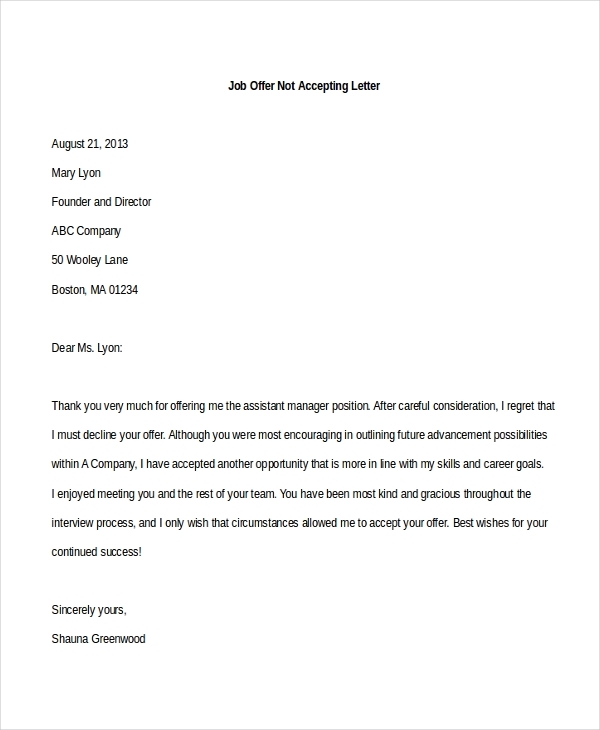 If a person accepts a job letter and then later decides to decline it for some reason, it is extremely crucial that he conveys this to the company in a professional way. This sample letter gives him an idea as to the right way to frame the sentences of the letter. You can also see Job Acceptance Letters. When a company wishes to offer a paid internship to a person, they can use this sample letter to get an idea of how to draft such a letter. This letter follows an acceptable format and comprises of the content which gives a professional feel to the letter. You may also see Job Application Cover Letters. 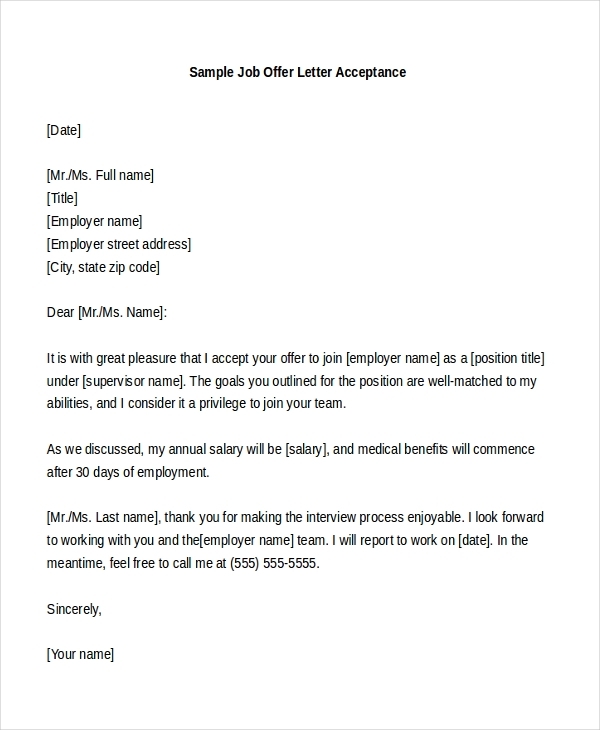 A person who wishes to accept a letter but is not sure how to put into writing can use this sample offer letter for the purpose. 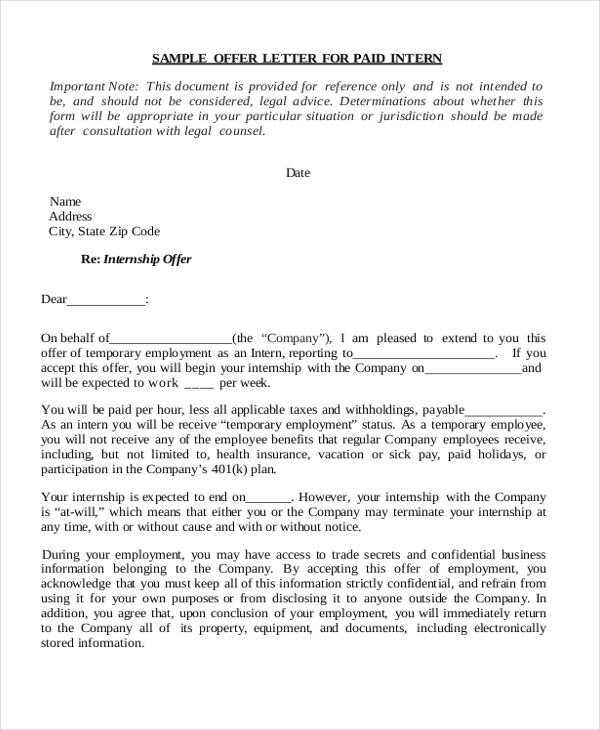 With all the sections in place and professional content included, he can quickly customize this letter to make it unique. What are the Benefits of Using Sample Offer Letters? Need some help in drafting an offer letter? Why not take a look at our collection of sample offer letters? You will find a letter for every need and will be able to come up with a unique letter within no time. Easy to download and customize, these letters help you to save a lot of time and effort. You may also see Personal Recommendation Letters.